Previously I have waited a lot closer to election day before finalising my predictions, often posting the eve before. This election, however, I will attempt to give my predictions a week early so that next week's post can be the post-election analysis and the weekend after that we can transition speedily into the April WA senate re-elections. This schedule should, hopefully, give us enough time to attempt some analysis of the data, consider the implications and cast some predictions before April 5. Also, in the interests of full disclosure, I should state that (as of last Thursday) I am signed up to conduct letter-boxing and the handing out of how to vote cards for Your Voice (Legislative Council Group X). That said, if I allow my own political biases to influence my predictions it will only serve to skew my calculations and cost my accuracy record, so if anything my vested interests are in being impartial. 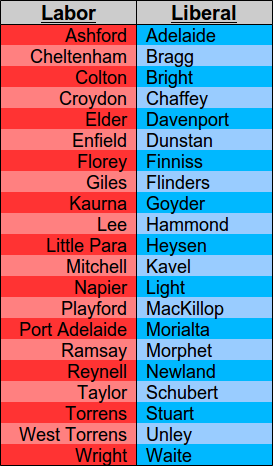 Adelaide (again), Ashford, Bright (again), Colton (again), Dunstan (again), Elder, Florey, Hartley (again), Light (again), Mawson (again), Mitchel, Morialta, Mount Gambier (again), Newland (again) and Wright are within the marginal (< 6%) range of the pendulum. 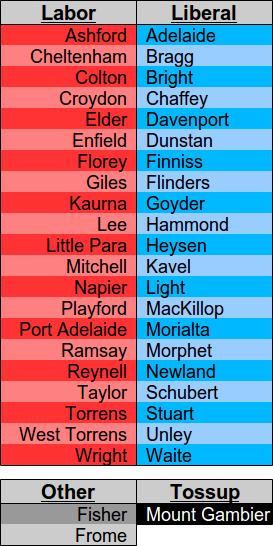 Also of note are the three seats from the weekbefore that were not consistently Liberal or Labor based on past trends: Adelaide (again), Bright (again) and Light (again). As it happens, all of these seats are projected to fall this way based on their lean (determined two weeks ago) and by all 5 reliable maps from three weeks ago. With 6/6 sources backing these predictions, these are the easiest of the easy to call. I have not factored in the pendulum yet, but by definition these seats are all held by there predicted winners by at least 6% and in most cases over 10%. The electoral boundaries of this state are supposed to be redrawn each election to correct the balance so that the state-wide vote roughly reflects the seat-by-seat make-up of the parliament. As such, the two party preferred vote should be roughly analogous to the end result (note that SA is just about the only place to do this). The February polling by Newspoll has the vote at 46-54 favouring the Libs. This is a two percentage point swing from the pre-election polling of 2010 (48-52)*. Using the baseline predictive model used by most media outlets, an across-the-board swing of 2% to the Libs will see Asford, Bright, Elder and Hartley changing hands, giving the Libs 22 seats, Labor 22 and 3 Independents. 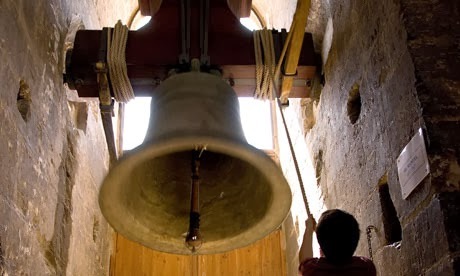 Time to dust off the hung-parliament alarm bell? While I am loathe to accept a uniform swing in all seats, lets assume that no Liberal-leaning or Liberal-held seats are going to go against the trend. This is an assumption that has messed me up more than once, but I have no predictive tool to identify these contrary seats so I've got nothing better. The Independent battles need to be assessed individually. Given that Mount Gambier always has been Independent since adopting the name in 1997 (Many consider this seat a continuation of Gordon) it is possible this will continue. The Independent vote always seems to out-poll the ALP then scoop up the preferences for a narrow win, often for a candidate overlooked by the Libs, so the 0.4% margin between IND and LIB does not necessarily make this a certain loss to the Liberal Juggernaut. Incumbency will assist Don Pegler. The swing expected swing from ALP to LIB might give the Libs the edge, though, undercutting the ALP-flow on. That said, most ALP voters who go on to boost the Independent might be more likely to switch to Pegler than completely leap the ideological fence. There is hardly any chance the ALP will out-poll Pegler – last election Labor's 2,724 primary votes were dwarfed by Pegler's 7,482. 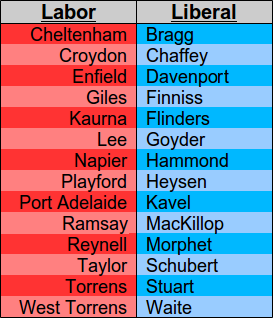 I'm going to assume most of the people disaffected with the ALP will still be retained by Pegler for an IND win, but my prediction is a tossup. 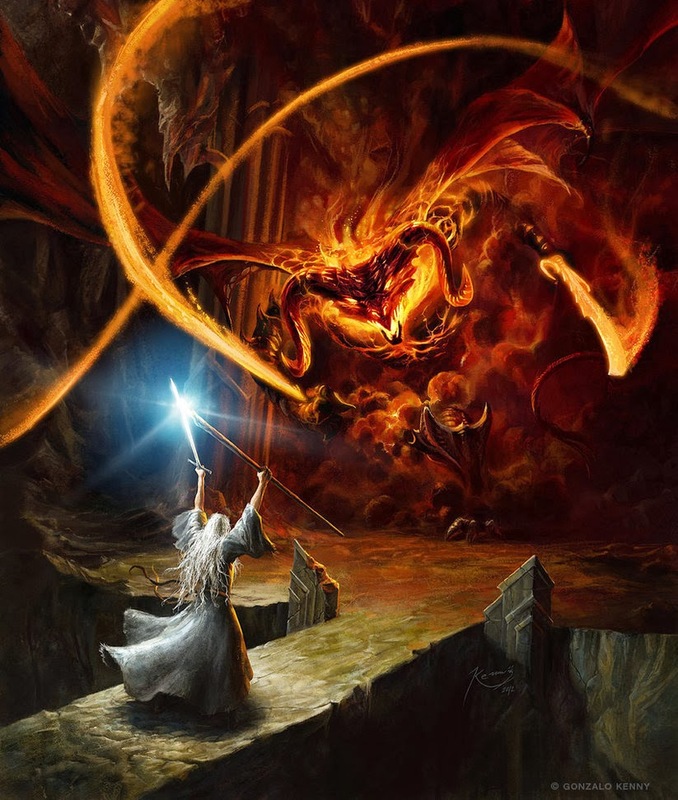 Is this the end of the ancient grey one? In Frome, Geoff Brock out-polled both major parties and, even with a loss of first-preference support, is further boosted by almost everyone. Confident win for Brock here. In Fisher, Bob Such had the highest Independent margin from 2010, almost out-polling Labor and Liberal combined. That said, the Liberal candidate Sam Duluk has been playing a very high-profile campaign against Such. Such has been rather high-profile in the parliament, however, sitting on several committees. I again expect an Independent win. That just leaves Hartley and Mawson. Both are Labor leaning, though slight, both are marginal, and both were found to be ALP in full average of seat histories map, the 10% opacity layer map and the VDTA, but Liberal in the history average since 1993. Hartley has a 0.1% margin, so I'm willing to call that Liberal. Mawson is 4.5, and may well resist the swing. I could call this my second and final tossup, but there is something nagging me about Ashford's 0.6% margin. I'm going to call Mawson ALP and move Ashford to the tossups. 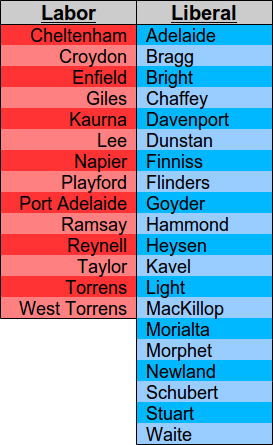 Mount Gambier is either going to be a conservative IND or a Lib. Although state and federal politics has seen conservative Independents back the Labor party in the none-to-distant past (probably because the Labor party will take their threats to cross the floor more seriously), I suspect any errors I have made will only favour the Coalition who, while possibly struggling to take the house outright, should have no difficulty in forming an alliance -- something Steven Marshall has explicitly not ruled out. So, tell me, where did I go wrong? Post your predictions and correction below. Or, you know, don't. It's easier to claim you were right all along that way. Blind guesses at the Legislative Council to follow shortly. TL;DR: Predictions as per final image. With the exception of Ashford (relegated to Tossup due to a small margin) the certainty of each prediction is greatest when they can be assigned in the earlier charts, with the more dubious results added in the final graphic. *Although the TPP result favoured the Libs and the ALP retained power, the boundaries were not drastically altered to compensate since the reason for this was determined to be a curiosity of the election rather than a demographic shift.